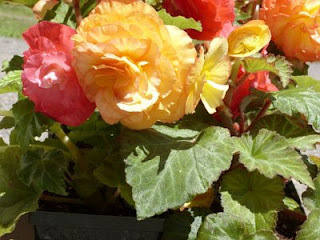 These lovely begonias made me smile when I picked them up at Glenburn Gardens a couple of weeks ago. The picture barely does them justice, so striking are their colors. I've had to keep them under wraps, however, since we have had so many frost-threatening nights. I only hope the full moon in early June is the last chance of frost we get this spring.